To a mercantilist, Rwanda is more important for the Health of Uganda’s economy than China, India, Japan, the UK and USA! Recently, I tweeted about a viral photo that according to reports originated from Southeast Asia early last year. 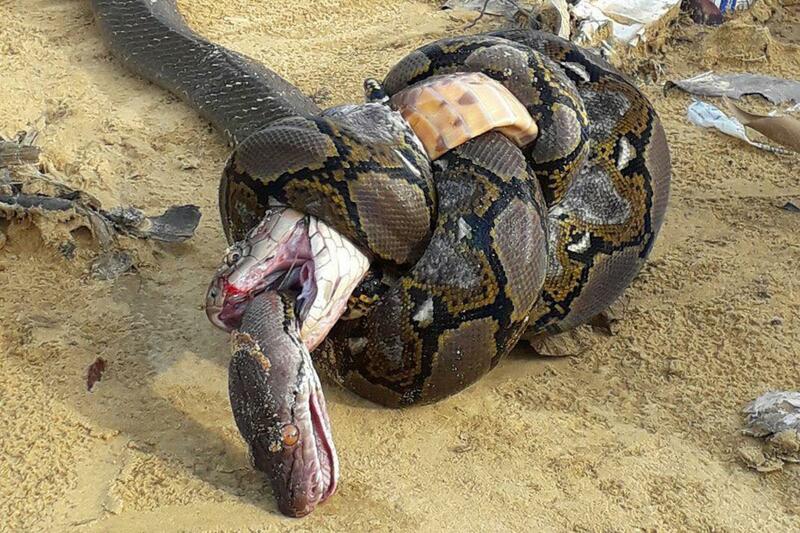 In the photo, two of the world’s most dangerous snakes – a cobra and a python – lay lifeless on a wet sandy ground. This story fits perfectly well into what is likely to happen should Uganda and Rwanda decide to take their current ‘misunderstanding’ to another level. Like one of my tweeps (so they call people who follow another on Twitter) put it, “The story is incomplete: House flies fed on the stupid snakes.” And perhaps even the houseflies, which might celebrate the demise of the two reptiles, might have died from eating the venomous flesh. Away from analogies, this article is intended to analyze how Rwanda is strategic for Uganda. By extension, the main rationale is to show why it is in Uganda’s best interest to ensure that the ongoing conflict, whose genesis is not as clear to the citizens of both countries as it may be to the two Presidents, does not escalate into a war. 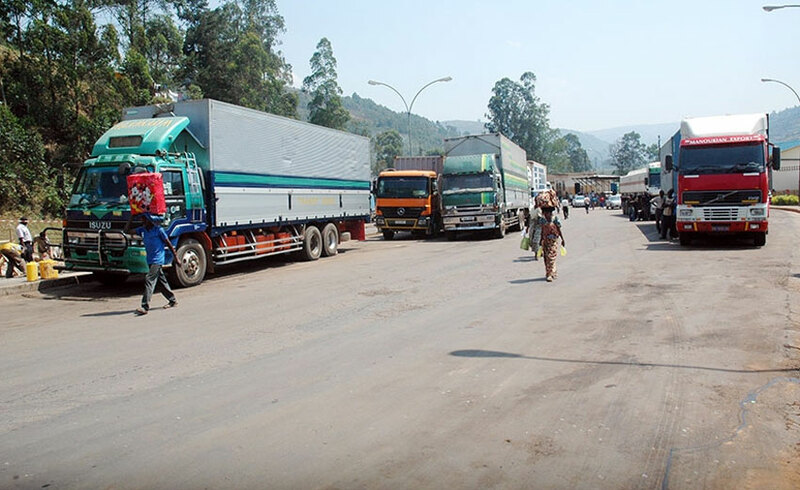 Since late February, Rwanda has kept her border closed and stopped Rwandans from crossing to Uganda. In recent weeks, media reports have shown the two heads of state getting their armies ready for war. Without going into the merits and demerits of the conflict, my main intention is to analyse the economic costs of this misunderstanding, particularly to Uganda. How much trade between Uganda and Rwanda? Over the years, Uganda’s trade has smoothed in intensity and direction away from inter- to intra-regional trade. In 1999 the European Union (EU) was Uganda’s main trade partner contributing over 57% ($280m) of Uganda’s total export receipts then ($490m). Last year Uganda exported goods and services worth $1.6 billion to EAC, COMESA and the Rest of Africa which constitutes 44%v of the total export receipts. In the same year, Uganda earned only 15% ($542m) of her total export receipts ($3.6 billion) from the EU. Rwanda bought goods and services from Uganda worth US$257m (Ushs. 950 billion) and earned only US$18m (Ushs.66 billion) from Uganda. This implies a favourable net balance of trade of US$239m for Uganda. In other words, last year the Rwandans donated to Uganda over Ushs.884 billion. 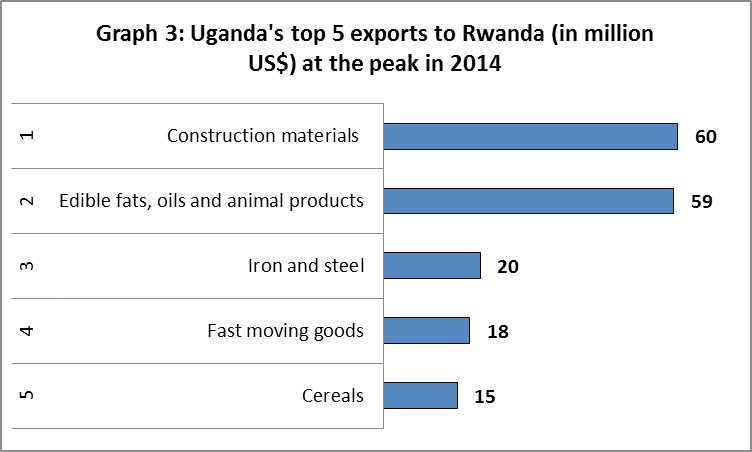 Actually Rwanda is fifth among the top buyers of Uganda’s exports (see graph 1). 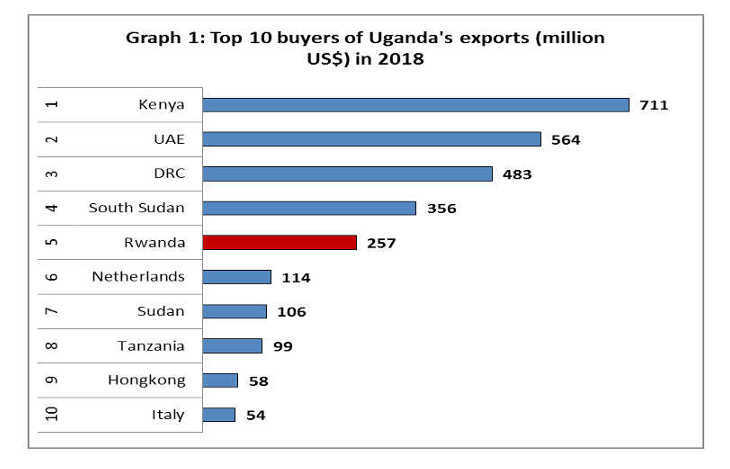 In the eyes of a mercantilist (a person who believes in increasing wealth by maximizing exports and minimizing imports), Rwanda is more important for the health of Uganda’s economy than countries such as China, India, Japan, the UK and USA (see graph 2). What do Ugandans sell to Rwanda? According to data from the International Trade Centre (ITC), and in the order of prominence, Uganda mainly exports to Rwanda construction materials (earths and stone, plastering materials, lime and cement); Animal or vegetable fats and oils, prepared edible fats, animal products (meat, milk, cheese etc. ); fast moving goods (basic manufactures such as), and processed food (see graph 3). Others include cereals (maize, wheat, rice, sorghum etc. ), iron and steel and their products, tubers (potatoes, cassava etc.) as well as several manufactured products (plastics, sugar, beverages and spirits, paper, wood, chemicals, etc.). It is clear that Rwanda’s basket of imports from Uganda constitutes the latter’s typical export commodities and products. It, therefore, goes without saying that the ongoing tensions between Rwanda and Uganda are directly impacting the average Ugandans who produce these merchandises. 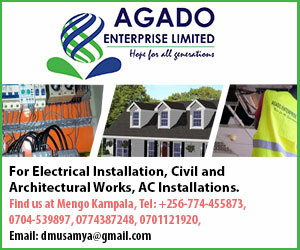 Why is Rwanda strategic for Uganda? First is what marketers call “market familiarity” – Ugandans produce commodities and products that meet the tastes and preferences of Rwandans. The people of Rwanda and Ugandans share culture and traditions. We are accustomed to the same food, clothing, and general ways of living. Indeed even the goods that we trade across our border are the same. 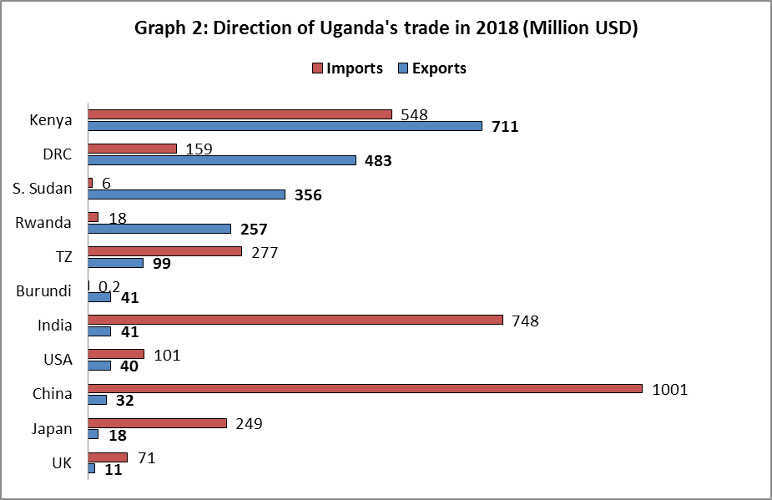 A look at the export and import products between Uganda and Rwanda shows the very goods that one country exports to another are the same she imports from the other! Second is proximity. Unlike other markets that look lucrative on paper but inaccessible because of the tyranny of distance (such as the USA, UK, China and others), Rwanda is closer to Uganda which makes it easier for firms to export to her markets at the lowest cost and time possible. Third, Rwandan market poses less stringent standard requirements compared to markets such as the EU and USA. Although on paper countries like the 28 EU member states and the USA show open market access for African firms, they hide under safety and health regulations to impose stringent requirements on imported products than on their domestically produced goods. They do this to protect their local producers. Like Ugandans, Rwandans buy unbranded (and somewhat poor quality) fruits, vegetables, cereals, tubers and fish and animal products. Europeans, Americans, and most Asians cannot. Lastly, the historic ties between the two countries make Rwanda a very accessible market for Ugandans. We have lived and fought our liberation wars together to the extent that “Banyarwanda” is mentioned in the Third Schedule of Uganda’s 1995 Constitution as 20th among Uganda’s 56 indigenous communities. Who is more likely to suffer? Therefore, this ongoing conflict is likely to affect, if not already affecting, the ordinary citizens of the two countries. Farmers and small-scale manufacturers are losing a $250m market. That’s not something to joke about. It means livelihoods and businesses ruined (farmers, producers and service-oriented firms), jobs destroyed (traders and transporters), incomes lost, government revenues lost, and in the nutshell wellbeing of people (happiness) destroyed. Apart from economics, the closure of the border by Rwandan government is making lives of the citizens of the two countries difficult. Think about children who cannot go to school and the trauma their parents go through right now. Think about the youth whose engagements in the cross-border social networking space can no longer take place. This is affecting the general happiness of people (life’s ultimate goal and meaning). On March 20th, the 7th World Happiness Report – which ranks 156 countries by how happy their citizens perceive themselves to be – was released. Uganda is the 2nd happiest country in the region (after Kenya) and Rwanda the second most unhappy (after Tanzania). The rankings were aptly based on how governments impact people’s happiness. Other determinants of happiness included pro-social behaviour (creation of social spaces where people can interact as opposed to erecting concrete perimeters around homes and communities), information technology, and of course income. A country that can unilaterally close a border without considering the wellbeing of its citizens cannot preside over happiness, however well its government performs on variables such as corruption, healthcare, education and security. It is in the best interest of the leaders of Rwanda and Uganda, and indeed for the good and happiness of the people of these brotherly countries, to find ways of de-escalating the tensions that have been building lately. We cannot talk about Africa free trade, when we cannot keep our borders open for the little trade that keeps our small economies going.